Prosapogenin A exhibited cytotoxic activity against the cancer cell line K562 in vitro. 23-Hydroxybetulinic acid is a triterpenoid. It has a role as a metabolite. It derives from a hydride of a lupane. Miquelianin (Quercetin 3-O-glucuronide) is a metabolite of quercetin and a type of natural flavonoid. Coniine is an alkaloid isolated from Conium maculatum L. It has properties as an analgesic, antineuralgic, & teratogen. 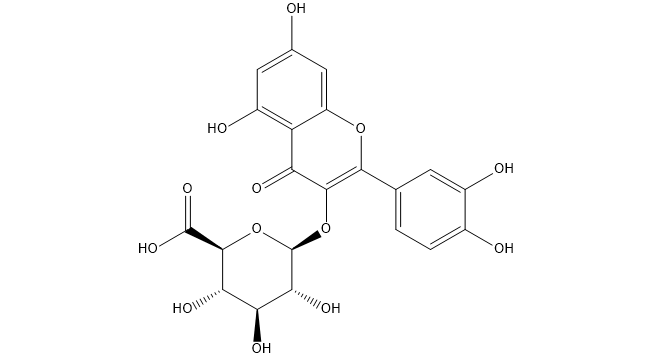 Raffinose is a trisaccharide occurring in Australian manna (from Eucalyptus spp, Myrtaceae) and in cottonseed meal. Fenuron is a chemical compound from the group of phenylureas used as a herbicide . Sapropterin dihydrochloride is a synthetic form of BH4 that is approved for the treatment of BH4 responsive PKU. 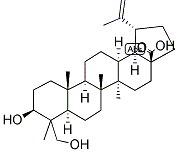 Sapropterin is a Phenylalanine Hydroxylase Activator. The mechanism of action of sapropterin is as a Phenylalanine Hydroxylase Activator, and Breast Cancer Resistance Protein Inhibitor, and P-Glycoprotein Inhibitor. Cepharanthine is a bisbenzylisoquinoline alkaloid from tubers of Stephania; stimulates recovery of immunologic function in lymphatic system after administration of antineoplastic agents or x-irradiation. 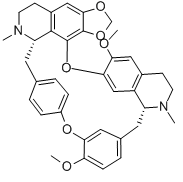 It is a member of isoquinolines and a bisbenzylisoquinoline alkaloid.